LUCKY SEVERSON, correspondent: When the sun comes up in Second Life, which it does every four hours, you are immediately overwhelmed by the vast, brightly colored mish-mash of stores, houses, and malls stretching across multiple continents—all of it, including the mountains and forests, designed and built from scratch by the tens of thousands of people who regularly visit here. Move your mouse and you tour the Taj Mahal. A few clicks and you are launched on a NASA rocket into low orbit. Click again and you can join a service in an Anglican cathedral. This live, online world called Second Life was launched in 2003 by the San Francisco company Linden Lab and its founder Phillip Rosedale, who says he had no idea what would happen. PHILIP ROSEDALE (Chairman of the Board, Linden Lab): Well, I always figured in the beginning that if Second Life looked like anything we were able to predict that we would have failed, that if it was predictable we weren’t doing the right stuff. SEVERSON: Second Life is definitely not predictable. Turn a corner and you might run into a furry animal that talks. It isn’t just the buildings that are designed by residents. They also design themselves, creating virtual bodies called avatars either sculpted in their own likeness or, more often, someone they would like to be. And then they chat with other avatars, even becoming close friends. For some, the virtual world is a way to escape. Others say it enriches their real-world lives. (to Michael Adcock): You still seem to get this social value out of it. MICHAEL ADCOCK (Freelance Designer): Yeah, I do. SEVERSON: Michael Adcock has been into Second Life for about three years. He says, for him, hiding his real identity behind an avatar which, in his case, looks like a warrior painted in silver, has helped him learn more about himself. MICHAEL ADCOCK: I’ve found that I’ve been able to be a lot more up-front and blunt in what is on my mind right away. That happens to say quite a bit about myself, and I choose to look at that as a learning experience. SEVERSON: Most people in Second Life don’t use real names. The woman you see here might actually be a man, or vice versa. This avatar actually is a man. He’s Tom Boellstorff, an associate professor of anthropology at the University of California, Irvine and editor-in-chief of the American Anthropologist. He has written extensively on the culture of virtual worlds. PROFESSOR TOM BOELLSTORFF (University of California, Irvine): For some people, the escape factor is one of the best things about a virtual world like Second Life. You can try having a totally different life, and there’s people who get married inside of Second Life to someone that they don’t even know who that person is in the physical world, even if it’s really a man or a woman in the physical world. They have a house and even virtual kids and a job, and they have a whole life inside of Second Life. SEVERSON: It costs nothing to get into Second Life, but if you choose to be part of it, to build a home, for instance, then you will have to spend real money. It’s like visiting a foreign land. You convert dollars into Second Life currency called Linden dollars. PROFESSOR BOELLSTORFF: So here is what my house looks like. This is land that I own. I spent—this cost about $50 US to buy this land and about $15 a month to keep, to be able to continue to own it. That’s how the company makes their money. SEVERSON: You constructed a cathedral like this once? MICHAEL ADCOCK: Yeah, I did. SEVERSON: How long did it take you? SEVERSON: Eighteen months of your life. MICHAEL ADCOCK: Yeah, off and on, you know. MICHAEL ADCOCK: It’s deleted now. SEVERSON: Wait a minute. Eighteen months, and it’s deleted? MICHAEL ADCOCK: I couldn’t afford to maintain the simulation, to keep it running, yeah. SEVERSON: It would have cost him $350 a month to keep it. But there are other cathedrals he can visit which took other residents months or even years to build. MICHAEL ADCOCK: There is a cathedral right here. SEVERSON: You don’t look like a typical Sunday churchgoer. MICHAEL ADCOCK: That’s true, I don’t. But they’re nice, and they welcomed me and asked me how I’m doing. SEVERSON: It took a decade for churches to have a strong presence on the Internet, but Professor Boellstorff says it is beginning to attract followers in Second Life. PROFESSOR BOELLSTORFF: There are already people I know who say that they go to, you know, every Sunday they don’t go to church any more in the physical world. 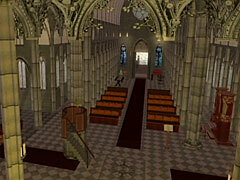 They go every Sunday to church in Second Life, and that is their faith community that they are interacting with. 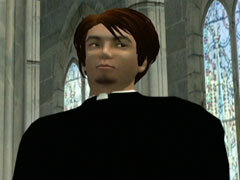 SEVERSON: We spoke with the leadership team of the Anglican Cathedral of Second Life. Mark Brown is the priest-in-charge. In real life he runs a Bible society in Wellington, New Zealand. Cady Enoch chairs the committee. She’s in Columbus, Ohio, and Helene Milena is the worship service leader. She’s in West Yorkshire, England. HELENE MILENA (Teacher and Counselor): I think there is an intimacy here, in any online set-up, actually, but at the same time there is an anonymity, and the two mean that people can be very, very open. It would be very unusual in real life to meet someone and ten minutes later be knowing about their difficulties with their marriage, or something of that nature. SEVERSON: In order to accommodate attendees from around the world, the virtual church is now offering 7 services a week. MARK BROWN (CEO, New Zealand Bible Society): Straightaway it is the opportunity to mingle with people around the world. We have about 20 nations represented in our community. I absolutely love that. I love the richness of that, that regardless of where we are in the world, we can come together and worship. SEVERSON: Second Lifers tend to become hooked on the experience. Michael Adcock says he was spending 12 or more hours a day for awhile. This can have negative consequences on real-world relationships. There have been at least two highly publicized divorces resulting from what were supposedly virtual affairs in Second Life. Questions are often raised about ethical behavior by people who can hide behind anonymous identities on the Internet. SIBLEY VERBECK (Founder and CEO, The Electric Sheep Company): If you look out on the Web, as long as there’s been forums where people post comments or chat rooms, people are often quite rude to each other, and a lot of that is that degree of anonymity that’s there. SIBLEY VERBECK: But it is more human, because you see this human figure, and you’re interacting with them in real time. MICHAEL ADCOCK: I don’t see much of a difference between what I’m doing here, or what I’m thinking, or what I’m doing in my real life. It’s all the same thing. SEVERSON: There’s not much you can’t find or do in Second Life. There are virtual shops that sell everything from virtual artwork to virtual waterfalls. Second Life is a community of creators, and it’s economy is based to a large extent on marketing art and architecture. PHILIP ROSEDALE: So far as we can tell, there’s like 60,000 people that are cash-flow positive from their operations, but there’s thousands of people that would call this employment of some kind. SEVERSON: Elisha Allen is director of new media and extended learning at the University of New Mexico. Like many learning institutions, the university is experimenting with Second Life as way to reach students who can’t make it to the campus. ELISHA ALLEN (Associate Director, New Media and Extended Learning, University of New Mexico): I’ve been to a number of conferences in Second Life where I had the opportunity to meet peers at other universities without actually having to fly there, and it’s interesting because the memories of those conferences are very real, and it did feel like I was there, wherever “there” was. SEVERSON: But Elisha agrees with those who say that navigating around Second Life can be daunting. ELISHA ALLEN: Second Life, while it’s maybe the state-of-the-art for virtual worlds right now, I think has a long way to go before it’s something that I would consider to be really, fully immersive. SEVERSON: For others, like Reverend Mark, it’s a godsend. 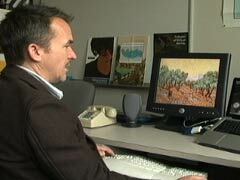 MARK BROWN: There’s no artificiality of me, here I am sitting in my study in New Zealand looking at a monitor. I am real flesh-and-blood. The way I am communicating and relating, of course, is different, but the same experience is welling up, and that is really how this is able to be intense and intimate and actually quite a real experience. SEVERSON: About a million-and-a-half people have visited Second Life in the last couple of months. They are typically in their mid-thirties. But there are millions of kids under 12 who are growing up with virtual reality games and programs designed especially for them. Verbeck and others predict that a decade from now, when these kids are in their 20s, places like Second Life are going to grow dramatically in popularity. 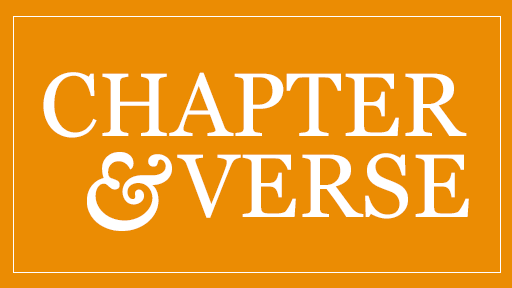 For Religion & Ethics NewsWeekly, I’m Lucky Severson in San Francisco.